Thermal Conductivity of Styro foam (5.4 x (10 exponent -5)) cal / cm / second / degree Kelvin from 300 degrees Kelvin to 78 degrees Kelvin. (3 inches and 2 inches thicknesses) ------------------------------------------------------------ N 9 [onr?] 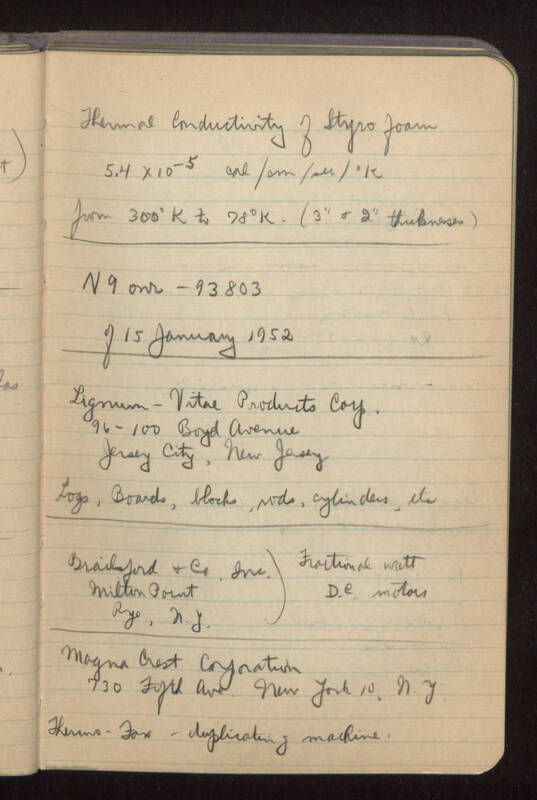 - 93803 of 15 January 1952 --------------------------------------------------------------- Lignum - Vitae Products Corporation 96-100 Boyd Avenue Jersey City, New Jersey Logs, Boards, blocks, rods, cylinders, etc. ------------------------------------------------------------------ Bradsford and Company, Inc. Milton Point Rye, New York fractional watt D.C. motors -------------------------------------------------------------------- Magna Crest Corporation 730 Fifth Avenue New York 10, New York Thermo - Fox - duplicating machine.